Can Mi 9 really meet up with the task and compete with S10? Xiaomi launched the Mi 9 alongside the Mi MIX 3 5G on the same day with Samsung but it’s too bad for Xiaomi, Samsung gained more presence bcos of its incredible line of S10 with new screen display and mouthwatering specs and of course, it was really hyped before the event day. The Mi 9 should be no less when it comes to eyes dropping specs. Being the second after Honor view 20 with the most beautiful design ever in 2019, the Mi 9 has a holographic glass design which is gracefully curved. The Holographic back cover design is really cool, and according to Xiaomi, it doesn’t reflect just a single color but a blend of metallic reflection and rainbow hues. It is said to be made with nanometer laser technology. There is a sapphire glass covering the triple rear camera with one of them being a Sony 48MP camera lens making it the second this year after view 20 and the Mi 9 is a primarily a camera smartphone. Over to the front is a waterdrop display design which I think shouldn’t be done/seen on a flagship device this year with lots of brands moving towards the HOLE PUNCH full-screen display. It also features reliable screen protection; Corning Gorilla Glass 6. Xiaomi Mi smartphones fans still get the notch in 2019, a 6.39″ inch Samsung AMOLED full-screen display which is really big considering not only the inches but the screen to body ratio which is approximately up to 90% with 3.6mm narrow chin. The display features a contrast ratio of 60,000:1 which is nowhere near the S10. The display is really good, but Samsung still has the best screen display so far, Mi 9 has a resolution of 2340 x 1080 full HD+ which gives the display up to 403 PPI, a standard mode; Sunshine mode v2.0, Night mode, color temperature adjustment, and up to 256 ranks adjustable reading mode. The screen has an anti-oil and anti-fingerprint protective coating and it supports HDR display compared to the S10 which supports the HDR+ display. 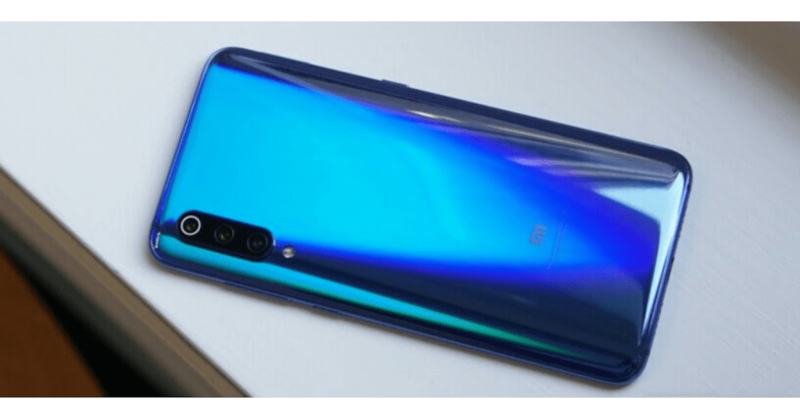 Xiaomi equipped Mi 9 with an AI triple back cameras which is aligned horizontally and it is one of the few devices to feature the 48MP Sony IMX586 wide lens with the likes of devices like Honor and Huawei. The first lens to the top is the primary lens which is the 48MP with f/1.75 which allows more light into the image sensor providing more detailed image and photo shot, second is a 12MP telephoto lens with f/2.2 plus it supports macro photography and lastly, a 16MP ultra-wide camera lens with f/2.2 aperture all working together to achieve a single purpose. Just like what we have on the Honor View 20, the camera is set to 12MP by default which can be changed to the full resolution (48MP) in the camera settings, it delivers vibrant, bright and sharp images with the help of an image processing technique called pixel-binning which combines 4 pixels of an image info to deliver best when you shoot. It not really about the pixel number, but it performs as expected just like the Nova 4 and view 20. The shots taken are sharp, more detailed with accurate colors, and a great dynamic range. Noise is also reduced to its lowest when a shot is taken in a low light environment with the help of those sensitive pixels, on board is also an auto-focus which works quite ok and it fast. Taking pictures in portrait mode is quite awesome with the bokeh effect working perfectly, but users will have to bear with the watermark at the bottom of the picture. The triple zoom with 2x optical zoom and 10x digital zoom which I find really amazing because of its ability to still maintain a good quality image production when a shot is taken at a distance. Over to the last lens, the Ultra wide-angle lens has up to 117 field of view which is closer to the one found on Galaxy S10 which has 123 fields of view, but do we understand what the Ultra wide angle lens primary function is? Its job is to help users take a wide range of photo shot like a group picture. Video recording is great on both ends of the device, with the ability of the 48MP to record 4K video at 60fps/30fps but one is missing, the OIS (Optical image stabilization) but not to worry, the EIS (Electronic image stabilization) covers for it. The Mi 9 camera is rated by DxOMark to be one of the best so far. We have on board the same processor used on all the Galaxy S10 line of devices, the Qualcomm Snapdragon 855 chipset with an Octa-core processor with a clocked speed of 2.84GHz and a design based on 7nm process technology. Mi 9 does quite very well in this section with the latest chipset which is capable of taking anything thrown at it from surfing the web, multi-tasking, playing high graphical games, and other heavy tasks with the help/support of the RAM (6GB) and the minimum internal storage is 128GB and it is optimized two turbo technologies for better overall performance experience and to double the acceleration. The device is said to outperform any current gaming devices and according to the Atutu benchmark, it surpasses more than 95% of other devices. Talking about gaming, Mi 9 is equipped with an optimized gaming experience (Game turbo acceleration). There is a non-removable 3,300mAh battery capacity with TUV Rhineland certified safe fast charge technology, wireless charging supports (20W which is the first of in the world) and 10W charging on Qi chargers. The battery might be looking small, but its power, it can take users through a day with a little evening toping though a 4,500mAh wouldn’t be bad for a device/flagship in 2019. The first thing I notice is the absence of the 3.5mm headphone jack and later got to find out that it has no microSD card slot either, which is a down thing for users. We have the speaker at the bottom, a USB-C reversible connector port, mic, and ear speaker to the top and a dual SIM slot. Most flagship device that has been launched has no physical fingerprint sensor. The in-display fingerprint was featured on some smartphones in 2018 like the Leagoo S10, the NEX and others but we will be seeing more of it this year with advance improvement, more secure, fast and reliable but not as fast as the physical one. The Xiaomi Mi 9 is running on MIUI OS v10.2 based on Android Pie. MIUI is known to be one of the best Android OS in the market, it takes the look of an IOS but it highly fast and flexible. Xiaomi is known for their life as custom ROM maker so they should know what to offer on their flagship in the OS section. The MIUI has features like gesture navigation, additional security when installing new applications and a dark mode display. The apps that come with the device (pre-installed apps) can be uninstalled and it has a file manager. The device is not resistant to water but dust giving the device a minus, a flagship in 2019 should and must be water resistant. A 3D facial security system is featured alongside other methods like PIN, password and the in-display fingerprint. The device supports 4G on both SIM (Nano) simultaneously, and they both support volte HD calling, we have the latest Bluetooth v5.0, Qualcomm TrueWireless Stereo Plus for Audio.